Excellentsubmitted by Gonzalo A. - Feb 27, 2019 |Recommended: YesThis is a really safe and good place to leave. Really good service and very complete. It is a very pretty place to live.submitted by Jose D. - Feb 23, 2019 |Recommended: YesI have some concerns about the rent going up every year. Our Salaries do not necessarily increase as much as the rent increases. This is a concern. Our last place did not increase the rent every year. The appliances when we moved in were not in good looking condition on the outside. They work fine, but they do not look fine. This was never addressed. This is embarrassing to me when we have company over as it looks like we do not know how to clean the refrigerator, dishwasher, etc. One of the plants died in front of our entrance and it was removed but it has not been replaced. Again, when people visit, it does not look too nice when you come to our front door. For my maintenace requests, I always asked for a courtesy phone call before anyone came over and I never received one. People just showed up at our door. The maintenance people themselves are very very nice and they do a good job. We are happy with all of the service we have received. The girls in the office are always very pleasant and nice to work with too. We have decided to stay for another year. response from property - Feb 04, 2019 Thank you for your review. 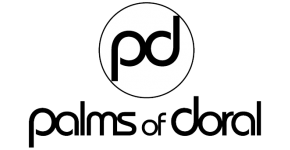 It means a lot to us, to know our residents are safe and happy at Palms of Doral. Great place to livesubmitted by Pedro H. - Oct 01, 2018 |Recommended: YesIt's a well maintained property. Beautiful surroundings, comfortable town homes. Maintenance team is always on top of any tenant need. Ladies from the leasing office are very helpful and available especially Michelle and Nathalie. Cozy, quiet, convenient. Pet firendly. Family oriented ambientsubmitted by Ricardo K. - Oct 15, 2014 |Recommended: YesI would like to mention the amazing staff, taking care of the villas. they all are very helpful and friendly. I hear so many different languages. and I love it. A Wonderful tranquil place to live!submitted by Elmer L. - Sep 29, 2014 |Recommended: YesA really enjoyable Complex! PERFECT!submitted by Geraldine C. - Jul 24, 2014 |Recommended: YesThe apartments are very nice and well kept. The staff are all GREAT, these girls are super nice. I have been here 3 years almost 4 and I have been very pleased with everything. GREAT PLACE TO LIVE, CLEAN, CONVENIENTLY LOCATEDsubmitted by DEIDAMIA R. - Sep 03, 2013 |Recommended: YesI HIGHLY RECOMMEND IT. VERY NICE STAFF, EFFICIENT AND POLITE. GREAT PLACE TO LIVE! Good place to live. submitted by Gary L. - Sep 03, 2013 |Recommended: YesLooks nice, great location, and the staff are very helpful. I do have to say the walls are a little thin and you have to work with neighbors to find quiet time.